Hill and upland farmers gathered at Dingwall Mart to hear how others have introduced new systems to make their businesses more profitable and resilient for the challenging times ahead. Attendees also had the chance to discuss what obstacles they face within the industry and how these could be minimised using their strengths and ideas. David and Barbara Girvan, who farm 8,000 acres of hill and upland ground at Corrimony and Buntait in Glen Urquhart, explained how rotational grazing and the use of low maintenance beef and sheep breeds have boosted productivity without the over-reliance on subsidies. 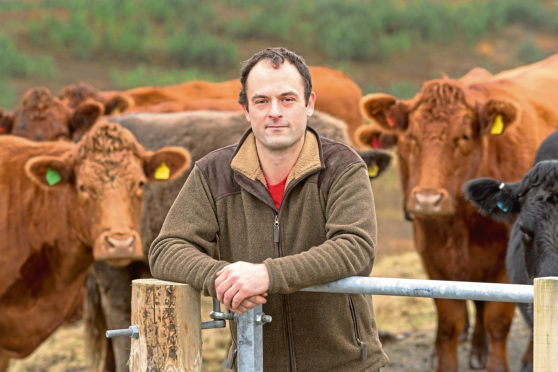 David said: “We’ve had quite a viable and profitable farm over the years but there’s a lot of uncertainty and I don’t want to be relying on subsidies. I want the cattle and sheep to pay for themselves.” The Girvans run 150 suckler cows, of which half are Stabilisers, and find that the progeny grows just as quick as continental breeds. Bulls and heifers are sold for breeding and other bulls are kept entire and finished. A flock of 1,200 Lleyn ewes are tupped to the Highlander to introduce hybrid vigour for replacements or the New Zealand Suffolk for producing prime lambs. Since moving to these breeds, David pointed out they are less labour intensive. He said: “Our 1,200-ewe flock is a one-man operation and we buy recorded performance tups which minimises problems. Rotational grazing was introduced to the farm six years ago and the family can now utilise 80% of grass, which equates to 50 hectares of extra ground. This has reduced feed costs and David hopes to increase the weaning weight by 2kg per lamb when having the cattle follow on from the ewes in the rotation. Meanwhile, Jim Simmons who farms with wife Lesley at Ruthven Farm, Tomintoul, shared his story. The couple run 550 Blackface ewes, 200 Mule ewes and 100 Shetland Cheviots ewes on the 800-acre upland unit. In 2010, they undertook a Scottish Rural Development Programme (SRDP) scheme and planted 30,000 hedge plants and 4,500 trees. The mixed woodland was planted in boggy, unproductive areas and on wet corners of fields that have fluke habitats. These areas have been fenced off and have dried off the edges because the trees are using the water. Jim said survival rates in the flock are much higher now and that they’ve created wildlife habitats. He added: “You need to make the best use of your land and ask yourself how you can improve it while benefitting wildlife but not losing the productivity capacity of your farm. The event was organised by the Rural Innovation Support Service, in conjunction with Scotland’s Rural College, SRUC, and NFU Scotland.